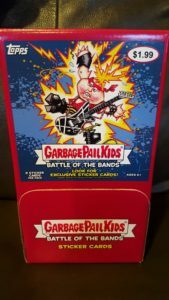 This is Part 2 of a two part series on the production of 2017S2 GPK Battle of the Bands. If you missed Part 1 you can go here to catch up. 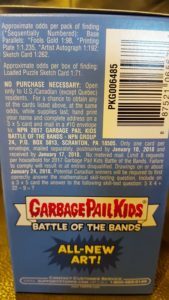 In the first post we looked at how many packs/boxes/cases were produced of 2017S2 Garbage Pail Kids Battle of the Bands. Here’s a review of what we came up with. Still there are some things we just can’t determine. 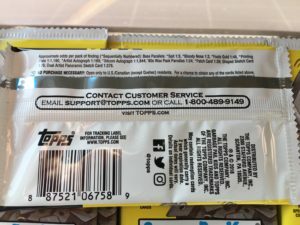 Topps has made it tough on us in recent releases. They no longer share a lot of information on the sell sheets for insertion numbers. 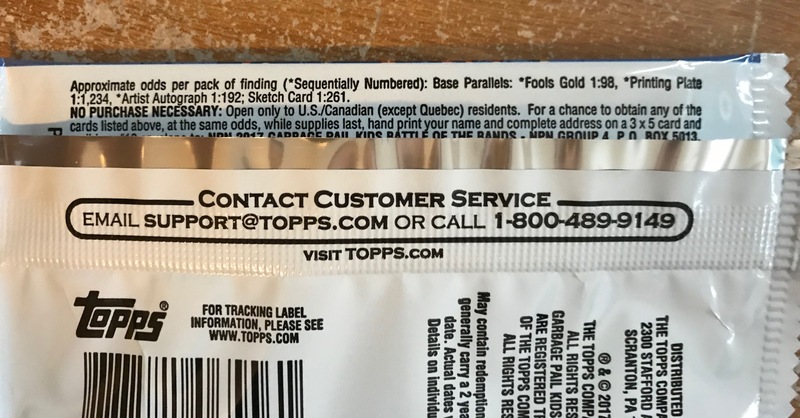 This means we can not figure out each different retail pack type. Therefore, there are many retail items that we are unable to determine the production on. For example, the Yellow Phlegm borders. 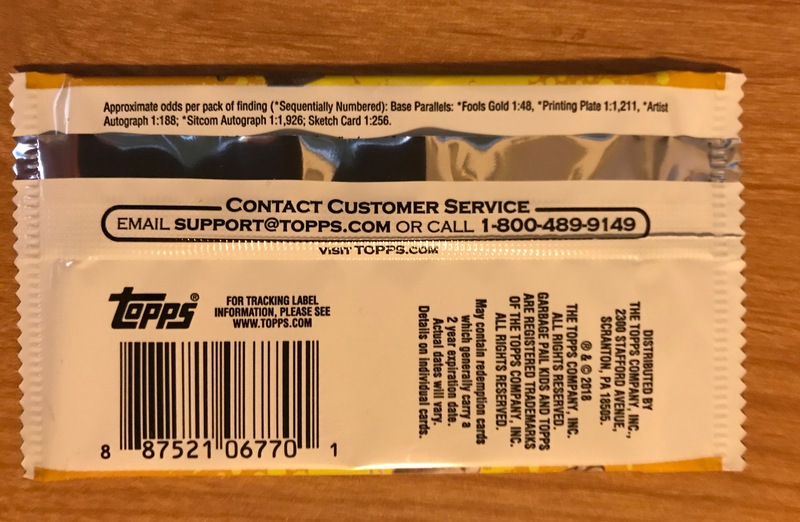 Since there is no way to break out the number of gravity feed packs from the other retail packs, we can not determine how many Phlegm borders were made. 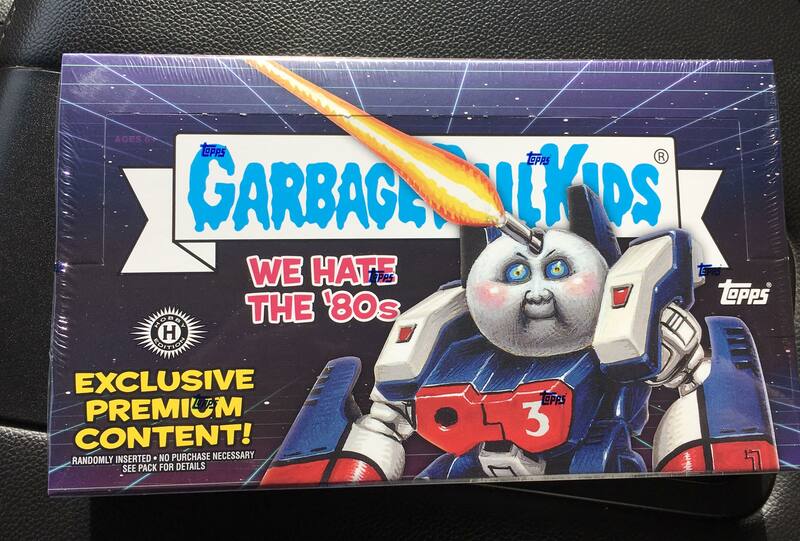 This also true for the various retail bonus sets; Classic Rock (Jumbo Insert Set), Gross Bears, and Bathroom Buddies. However, with production being slightly down compared to Adam-Geddon, you should see similar numbers of those this series. The lack of retail breakdown also means we can not determine how many Loaded Sketches or Panoramic Sketches were inserted into packs. While we can’t figure out the Yellow Phlegm parallel, we can determine how many of the other two non-numbered parallels were made. We can also find out how many of the Concert Posters & Album Covers bonus inserts were made. 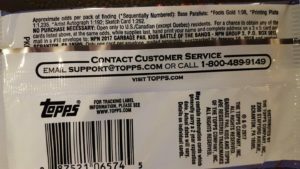 Bruised Borders – 41,000 Collector packs X 1 Odds (doh) = 41,000 total Bruised borders / 180 cards in set = 227 per card. 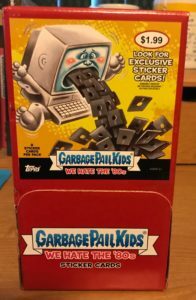 Puke Borders – 400,000 Retail packs X 1 Odds (doh) = 400,000 total Puke borders / 180 cards in set = 2,222 per card. Concert Posters & Album Covers – 41,000 Collector packs / 24 Odds = 1700 total cards / 10 in set = 170 of each card made. How do these numbers compare to the previous set, Adam-Geddon? Since there was 5,000 more Collector packs this time the total amount of Bruised parallels is higher. Conversely, with retail being down slightly the number of Puke parallels dropped just a bit. Finally, the Collector only bonus insert set of Concert Posters & Album Covers is also up due to the additional Collector pack production. One thing I always find interesting is to determine what pack types the printing plates and artist autographs are hiding? Retail always has the majority of the plates because over 80% of the production is retail. 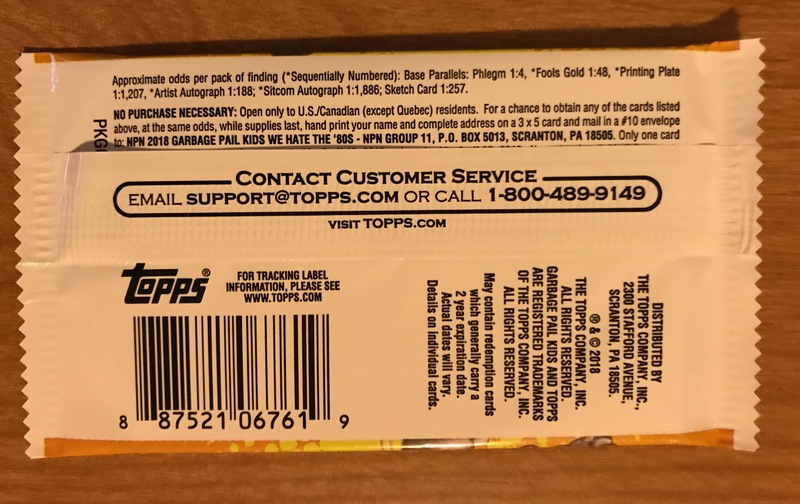 We know Topps inserted 360 plates into the production, so here is the breakdown of how many can be found in each pack type. A couple of interesting things to point on on the Plate and Autograph distribution. We can also use this number to corroborate our total pack numbers. Using our pack numbers with the odds comes out to 358 total plates inserted, thats really close to the 360 we know they put in packs. 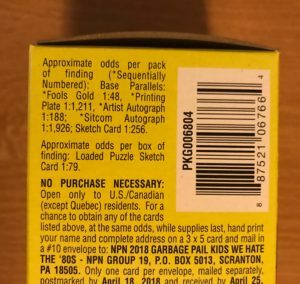 Using the pack numbers with Autograph odds we get a total of 2,297. 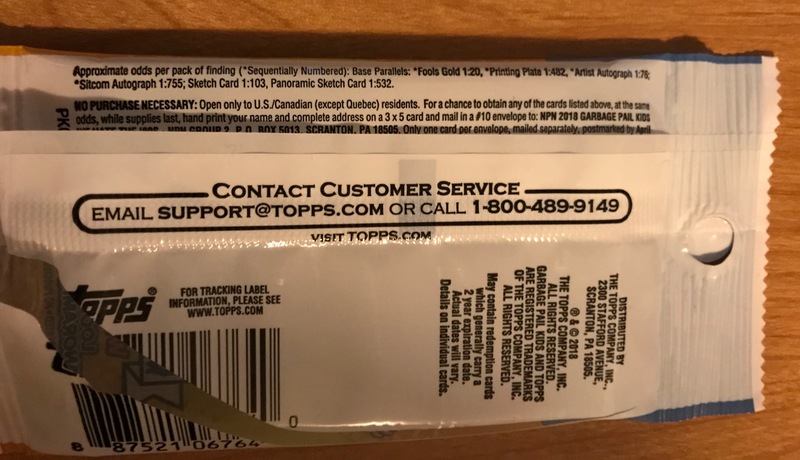 We know there are 2,250 inserted into packs. Again pretty darn close. This is another reason why I’m confident in the total pack numbers. The other interesting thing I noticed is even though Collector production is up, the same number of plates and autos are in Collector packs as Adam-Geddon. This explains why the odds are a little bit harder than the last series for those two card types. Shaped Sketches – 41,000 Collector packs / 79 odds = 518 Shaped Sketches in Collector packs. Dial Artist Panoramic – 41,000 Collector packs / 395 odds = 103 Dual Artist Panoramic Sketches in Collector packs. The number of sketches is up compared to the last series. The reason for this could be the large increase in sketch artists compared to Adam-Geddon. So far there are 49 confirmed sketch artists for Battle of the Bands. Therefore, the odds are a little easier this time around for pulling a sketch card. 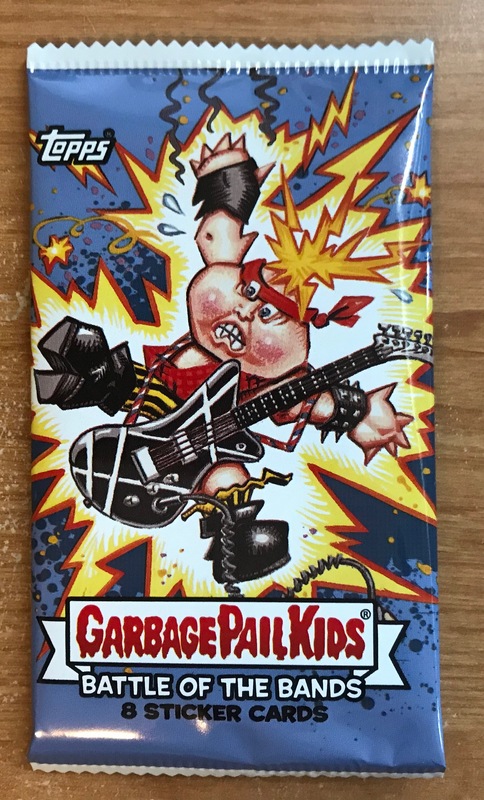 The production numbers of Battle of the Bands show interest in Garbage Pail Kids remains consistent throughout 2017. How the next set, We Hate the 80’s, turns out will be interesting. 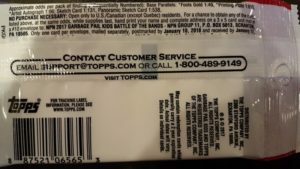 Base Cards – (41,000 Collector packs X 6 cards per pack) + (400,000 Retail/Hobby packs X 7 cards per pack) = 3,046,000 Total Base Cards produced / 180 cards per set = 16,922 Total of each base card. While that’s a ton, its down just slightly compared to Adam-Geddon. Time to get your groove on, and pick up a set of 2017S2 GPK Battle of the Bands! 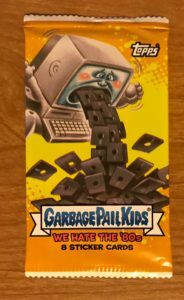 This is Part 2 of a two part series on the production of 2017 GPK Adam-Geddon. If you missed Part 1 you can go here to catch up. 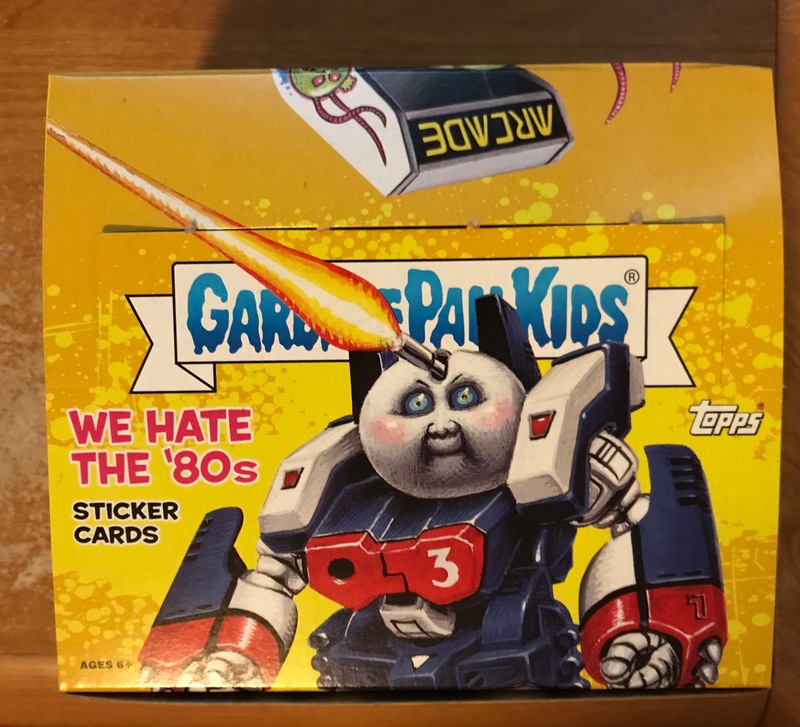 It’s been nine months since the last GPK retail release. 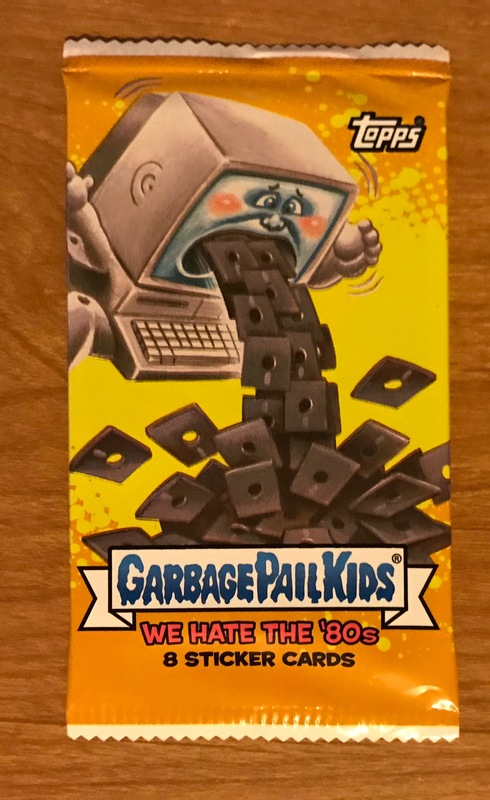 2017S1 GPK Adam-Geddon was well received from collectors, who enjoyed a lot of the artwork and end of the world type of gags. 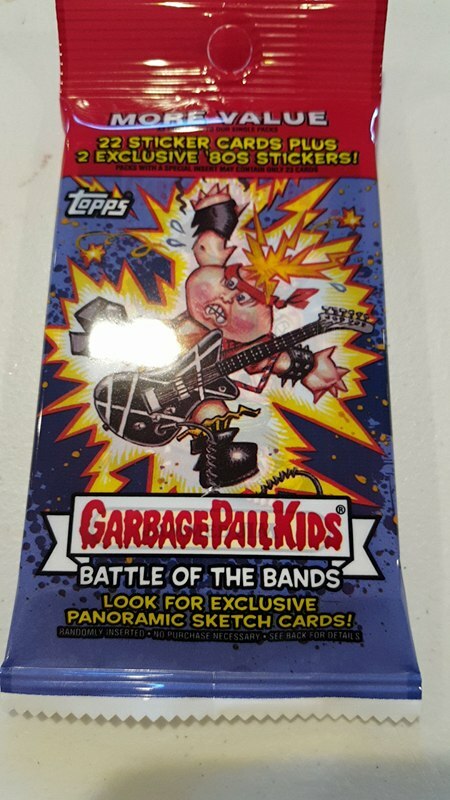 Topps has now launched 2017 Series 2 Garbage Pail Kids Battle of the Bands. This set is all about musical acts past and present. 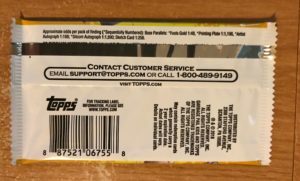 Topps is following almost the exact formula they used with 2017S1 Adam-Geddon, right down to the parallels and pack contents. The base set once again features 180 cards, broken down into 7 subsets based on musical genres. As has been the case for the last few years, the base cards lack card back artwork, sticker die-cuts, checklists, and numbering in on the back. You will notice the odds on the parallels are twice as high as previous sets. 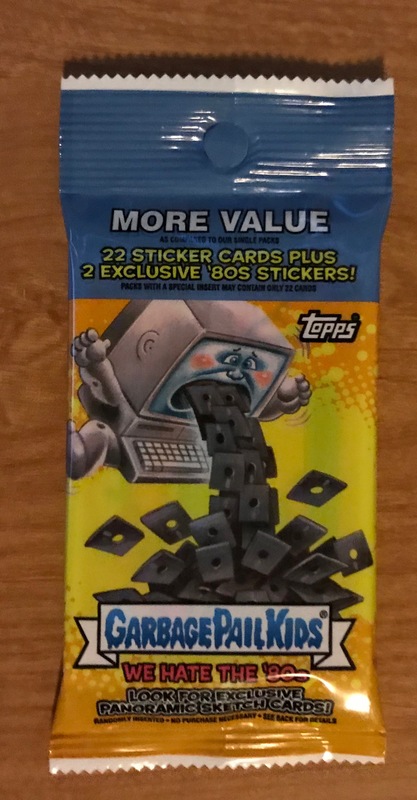 I believe Topps has overstated the odds. 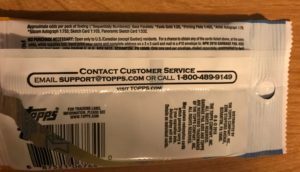 Based on box breaks parallels are falling at 1/2 rate of the stated odds. (GPKNews has reached out to Topps for comment, but as of this writing Topps has yet to respond.) I will have articles taking a stab at production numbers in a few days. 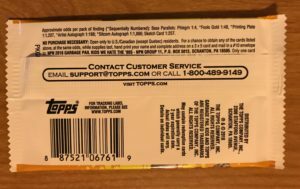 To see the official Topps checklist click here. Here is what you can find, and where you can find it in 2017 Series 2 Garbage Pail Kids Battle of the Bands. Base Set – 180 total cards made up of 7 different subsets. 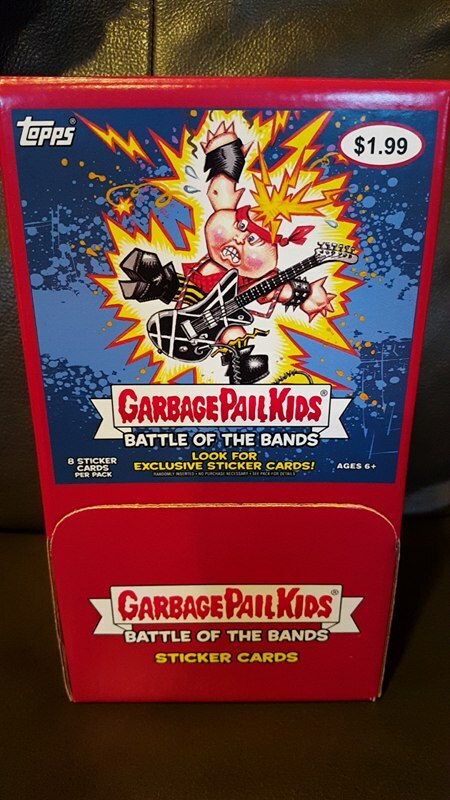 With the official release day of 10/18, cards for the next retail series, 2017S2 Garbage Pail Kids Battle of the Bands, have begun showing up. 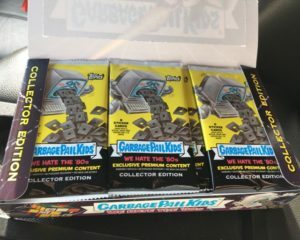 Thanks to Clint Coleman of GPK & Wacky Warehouse for sending along pictures of the first packs he’s been able to open. 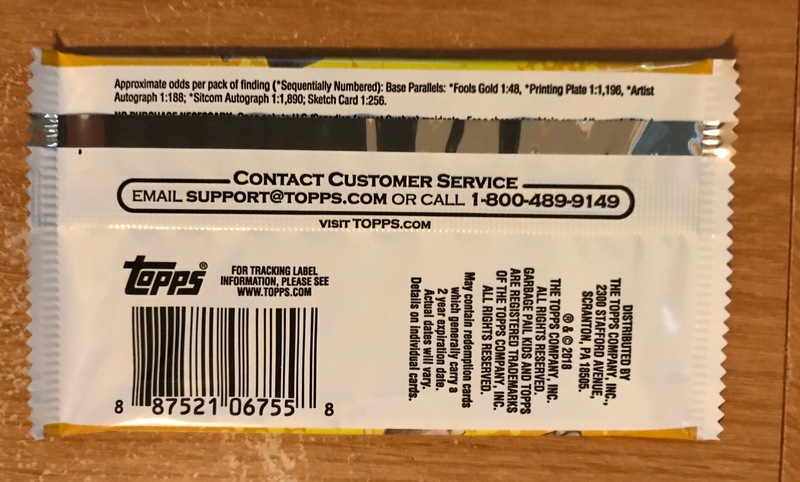 Odds for all retail pack types are below; Blaster, Jumbo Retail, Gravity, and regular Retail. 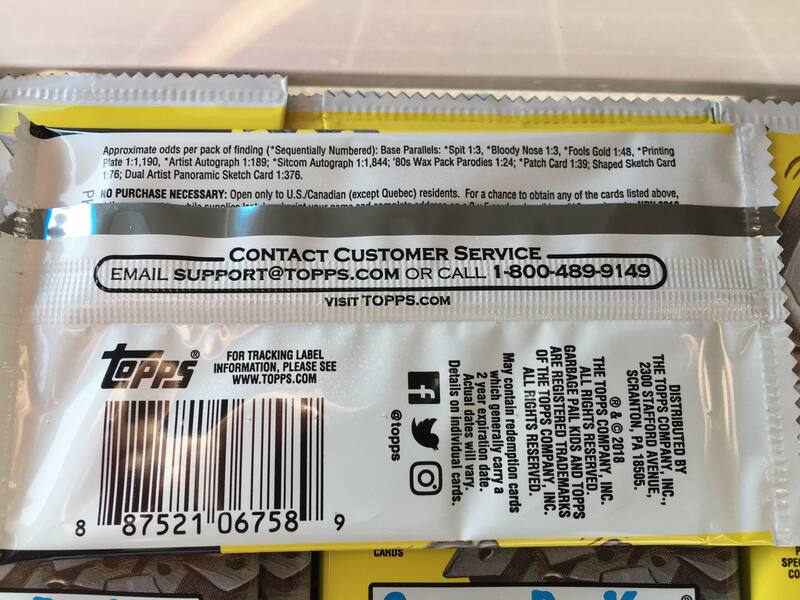 We posted odds on the Retail Blasters a couple of weeks ago thanks to Topps display at NYCC. 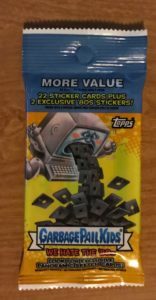 We can now confirm those are indeed the odds on Blaster packs/boxes. As usual the Jumbo odds look to be 1/2 of the retail packs. 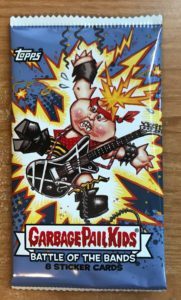 Jumbo packs contains 22 cards, plus 2 Classic Rock insert cards. 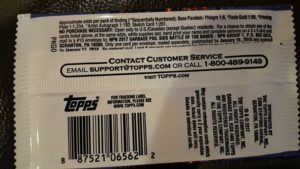 Topps considers those as 2 packs of retail, therefore the odds are 1/2 of what a normal retail pack in. Based on early results it appears production is up for Battle of the Bands. In the coming days I will post articles looking at productions numbers, but comparing retail this set to retail from Adam-Geddon it looks to be higher. 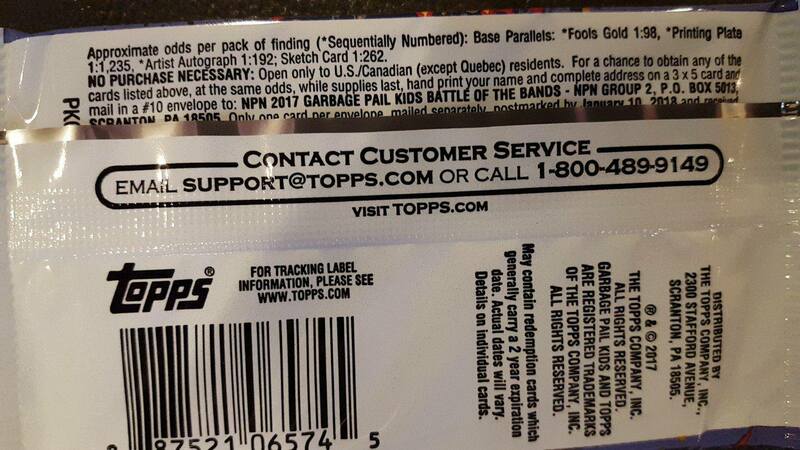 Of course we need to see odds from Hobby/Collector packs and the remaining Retail to make a determination. After seeing the first breaks, I am now beginning to think the odds on the parallels are overstated by double. I’ll have more on this in the coming days with some articles going over production numbers. 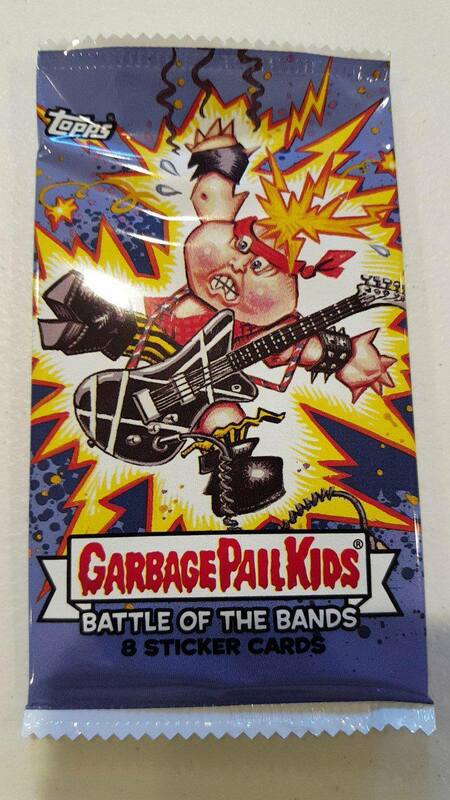 As 2017S2 Garbage Pail Kids Battle of the Bands card start showing up online, there are more odds to report. Thanks to mrcandl on eBay for sending over a picture of the Collector pack odds. The odds are quite different. 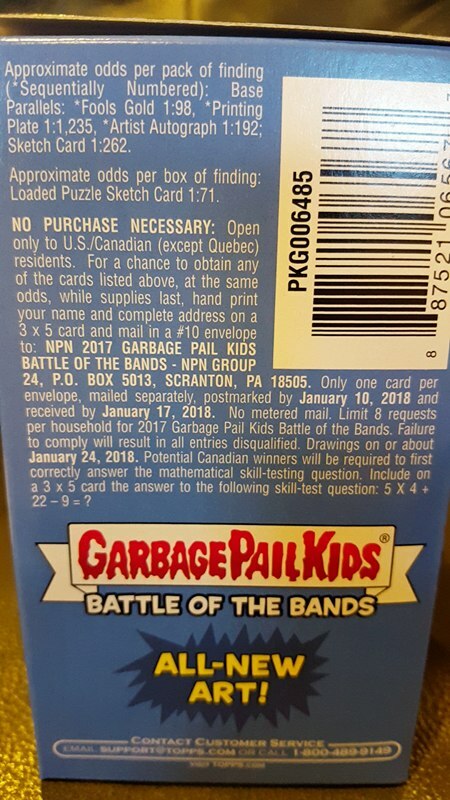 The pack shows odds for red and blue borders are twice as hard as previous sets. Odds like that should show 4-5 reds and blues per box. However, mrcandl reports that he is pulling about 8 reds and 11 blues per box. This is the same as previous releases, which should make the odds 1:2 or 1:3. The Gold and Autograph odds show the same exact as retail packs, while Printing Plates are very close. Do the odds being wrong on the reds and blues mean the odds are also incorrect on other types? Current Gold border odds indicate production would be double. 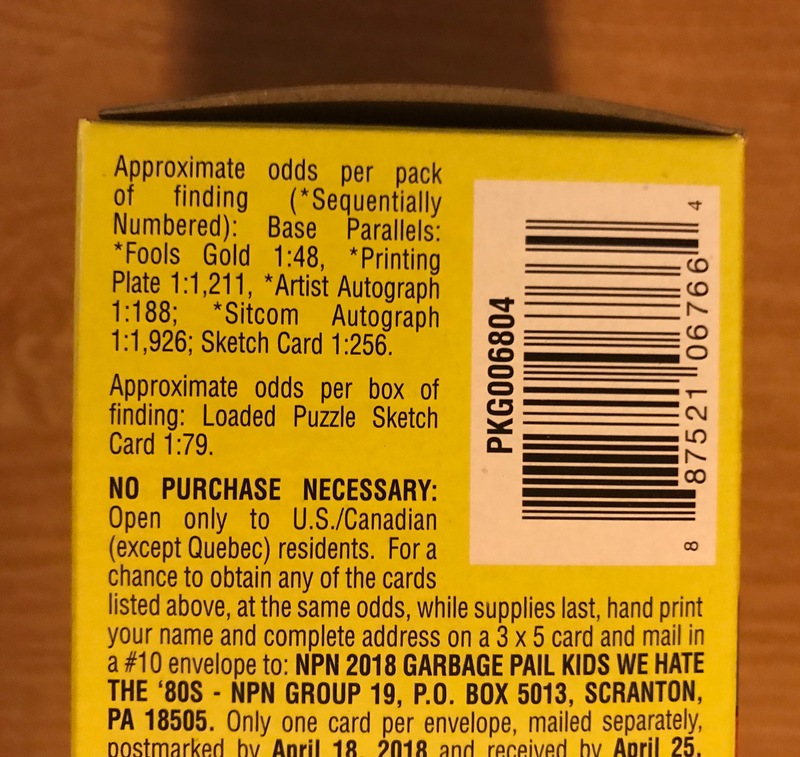 Some possible good news for collectors is the odds for pulling sketch cards a much easier, and in some cases half of previous sets. Only time will tell based on collectors results if the odds are correct. Hobby odds are also included below. 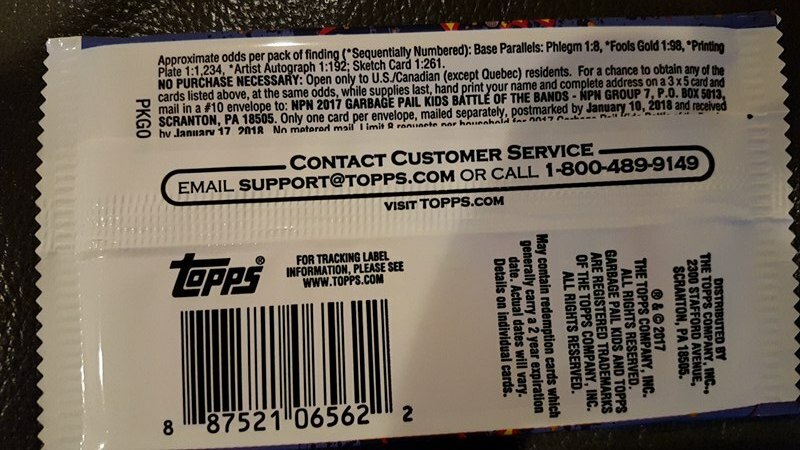 As a reminder Hobby packs/boxes are the same exact as regular Retail packs/boxes, so the odds are the same. 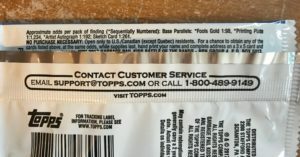 Once again there are no designations on the packs or boxes that say they are “Hobby”. 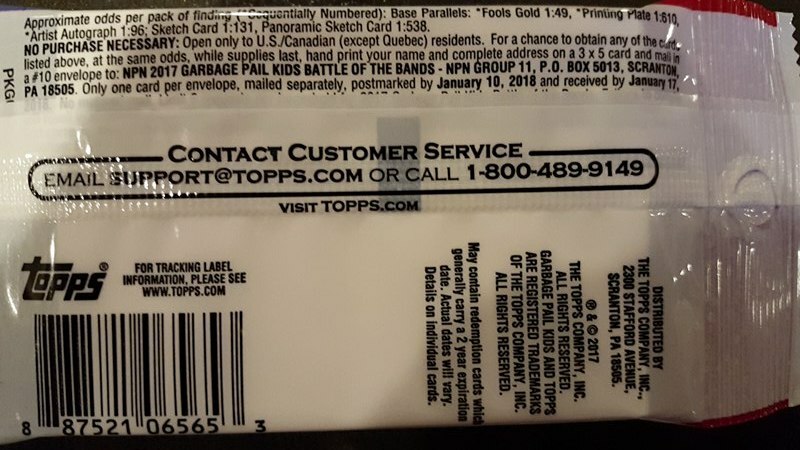 Here are the odds on Collector and Hobby/Retail packs.